This photo is from the collection of Ernest C. Baumert, who was chief of Maintenance and Engineering Branch for APC, was dated February 15, 1957. The caption stamped on the back of the photo reads, "2D SIG-102/SIG-57 APC, N.Y. Civilian and military personnel of the Army Pictorial Center, Long Island City, N.Y., are shown after completing the last class of the Management Conference sponsored by the Civilian Personnel Office of the Army Pictorial Center. 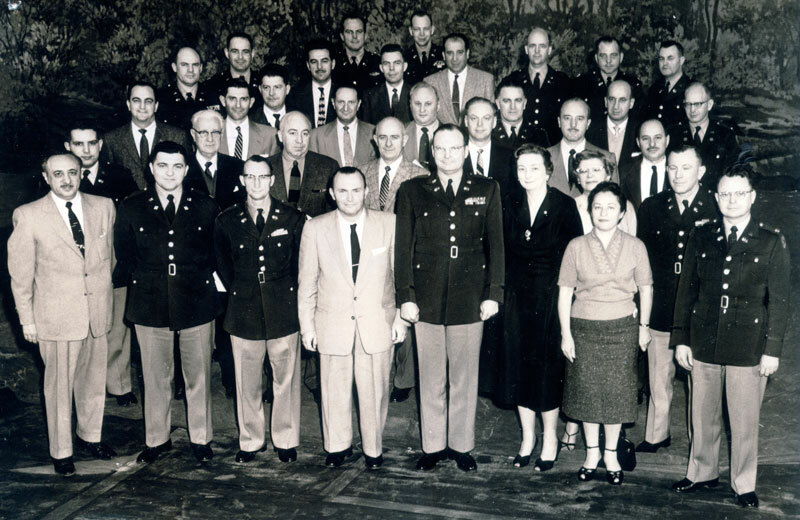 Shown with the group is Col. Arthur A. McCrary, Post Commander, Army Pictorial Center. Photo by SP1 James Downey, 2d Signal Platoon (Photographic) Army Pictorial Center, Long Island City, N.Y."
Ernest C. Baumert is fourth from left in the second row. Next to him, third from left in the second row, is Joe Lipkowitz. Colonel McCrary is fifth from left in the front row.